Do you have a home that is under rodent infestation? If so, you are definitely disappointed and frustrated by the damages that result from these creatures. Fortunately, you do not have to put up with this headache anymore because there are effective and reliable programs that can perfectly rid the structure of these terrible creatures. The program does not engage poison baits since they cause death of rodents in your ceilings, walls and any other inaccessible place at the house attracting a great deal of flies and emitting ghastly odor. Finding an animal removal company with well-trained personnel to carry out rodent proofing services at your home or even repair services is one of the most effective ways to put an end to the rodent issue. Rodent experts employ efficient techniques to exit the creatures and carry permanent repair to your home to keep them off for a very long time. Here are some of the essential steps that professional animal removal companies take to eradicate rodents. Rodents tend to find harborage inside your home particularly in the attics or subareas. On a daily basis, they will enter and leave their new structures as they look for food and water. Fascinatingly, rodents rely on their kinetic memory to move around the house. This knowledge comes in handy particularly during home inspections as they enable an animal removal company personnel to determine all the places they go through so they can set traps at the most convenient places. In addition, when the animal removal workers find most of these places, they will seal all the entry points to shut the rodent outside the house. An effective exclusion strategy entails detailing some of the most uncommon entry points to the house during an inspection. After the inspection and a clear speculation of the situation at hand, most animal removal companies will figure out the best methods of repairing these areas to keep pests from accessing the home. In most cases, it is highly recommendable to let an animal removal company to repair these places because they are good at it. They know the most effective and efficient materials to use for sealing these places. Still, you can do the repair for yourself if you have the time in your hands. Upon the completion of the repair services, the trapping part comes in to eliminate the remaining part of the rodent population from the house. Many homeowners who are eager to eliminate rodents from their homes may need to know how long the trapping process takes. Well, depending on the steps that an animal removal company takes before the trapping activity, the trapping period will vary. Prior to the conclusion of a proposed exclusion activity, the trapping may go on indefinitely. On the other hand, when the exclusion activity is complete, the most reasonable time with regard to the effectiveness of a trap is a month at the very least. Trapping the rodents relies on how knowledgeable the animal removal company is about them. Rodents are generally neophobic and can barely adopt new habitats because of reluctance. They will move to new places after ascertaining the possibility of sustenance. They will explore a place and determine whether it is a good source of food. With time, they will get comfortable and move to the new place. At this point, proper placements of traps in conjunction with the exclusion strategy will be used as food sources to trap the creatures. This process goes repeatedly for a few weeks until all the rodents are completely removed from your home. Animal removal companies will conclude the entire removal process now. You may wonder if you can play a part to assist in the removal of the rodents. Well, your technicians will make certain suggestions after wrapping up the exclusion process. For instance, a technician will ask you to trim all overhanging branches close to your home. He will also ask you to get rid of piles of wood or any other debris that encourage rodents to explore your home further while wreaking havoc. Ensuring there is absolutely no harborage for the rodents is one sure way to keep them from venturing further. When rodents become a terrible nuisance that you can hardly bare for a minute, you need the best animal removal companies that will professionally assist you in removal. They will offers great services from licensed experts with a vast experience in the field -who also undergo continual training programs to keep their vital animal removal skills in check. The advantage of working with well-trained personnel is getting quick services especially when you feel like the rodent situation at home just got out of hand. Therefore, find an animal removal company to assist you with pest control and elimination at home. Buzzes and terrible squeaks are probably the last thing you want in your home. Although blasting unwanted critters using potent poison may seem like an ideal way of eradicating them, the same toxic stuff that puts an end to pests is actually harmful to you. If you have young children at home, they are more likely going to be susceptible to this threat. Typically, pesticides deal with pests alone and not the underlying problem. As compared to prevention-based alternatives, they are not quite effective. This is why you need to know how to deal with pests around your home in a safe way and will not pose risk to you or your kids. These simple tips will help you put a lid on pests and keep your home safe from them. Most pests will come to your home if they find plenty of unwanted and unattended food and water. To make your home less enticing, you may want to revise your cleaning routines to ensure that the home is always clean and dry. Simple things like wiping up spills with soap and water minimize the chances of having pests sniffing around. On a daily basis, you need to take the garbage out. Since garbage cans are the place where you keep food residue, you need to ensure that after taking the garbage out you clean the garbage can leaving it free from food residue. If you have ripe fruit at home, always ensure that they are in the refrigerator. Dishwashing is paramount at home to keep off pests. Soak them in soapy water if you intend to wash them later. Moreover, make an effort to sweep and vacuum your floors on a regular basis. Pay attention to the bathroom and kitchen areas to keep them dry throughout. In the home, there are always potential entry points that invaders may make good use of to gain access to your home. It is your duty to barricade all these potential entry points to deny access to any kind of pest. Whenever you see cracks and crevices on baseboards, pipes, ducts, sinks, electrical outlets as well as toilets, make use of silicon caulk to seal them. Heating and cooling vents are also good entry points for pests. Seal them by placing a screen in front of the vents. Most average mice found in a home can make their way through very small holes particularly the size of a dime. Other factors that may give pests easy access to your home include stacked firewood, vegetation and any other debris that may be at the exterior of your house. Pests climb through them and get to your house. So do away with them to ensure they do not gain home access. Occasionally, you need to carry out an inspection to your house to see if there are any potential entry points for pest. In addition, you need to look for places in the house that need repair. Replacements play a big part in fixing certain things at home such as roof, gutter, soffits and fascia, garage doors just to name a few. These are places where pests gain access to a home. Inspecting your home lets you see some of the places that may be unattended and untidy prompting you to schedule time for cleaning. Furthermore, you will be in a good position to fix damaged fences earlier enough before pests find their way to your home. Most of the things said earlier are things that you can easily do especially if you have time in your hands. However, if your day involves tight and fixed schedule, you may want to look for pest control service company to handle all the trouble for you. It is quite simple. All you need to do is look for a reputable pest service company that is licensed to eradicate pests using safe methods. In addition, you need to inquire whether the service company gives warranties with regard to pest services offered. This is to assure you of quality services when you choose to work with a particular pest control company. Sometimes a service company may remove pest out of your home but you still end up having pest issues after some time. Warranties definitely sort this problem out for you. Pest control is basically a personal initiative because to eradicate pests from you home, you have to put efforts to do certain things. Thorough cleaning leaves your home with nothing enticing to pests. Pests will always look for a home that offers food and a comfortable habitat. Additionally, even though your home may be clean pests will still look for entry points to see if they can find anything in your home that can be a good meal. Sealing all these entry points makes it hard for pests to get in the house. Do not forget to inspect your home regularly to see if there is anything odd. 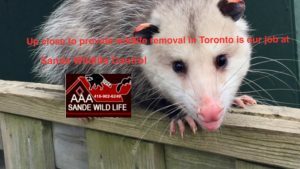 Opossum removal services are on the rise with home invasions in Toronto. Wildlife removal specialists at Sande Wildlife Control can handle any situation. If you talk to anyone who had an awful experience with Opossum removal services, he or she will tell you about a great deal of nuisance that comes with these pests nearby. You will know a Opossum by merely looking at them. They have brown/black bodies with sort of snow-white faces. The other striking feature about them is their long hairless tail they drag around. Being from the southern USA, Opossum are known to hang from trees, which here in Toronto I personally have never seen or heard of an Opossum hanging from its tail. Opossums are determined pests that will do about anything to get at their next meal. When they find a suitable place for food, they will return on a daily basis to wreak havoc and score their daily meals. In essence, there are certain factors that suit Opossums and the minute they see them in your home, you will be their target until the day they probably die. 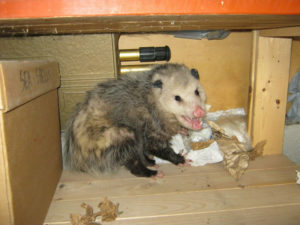 The following explains more about things that encourage Opossum invasion in your home. Where do you put unwanted or extra food? If you leave trashcans unattended or pay little attention to their situation, the Opossums will spot them and make your home a perfect source for their meals. Taking away their foods source is one of the most effective ways of keeping them at bay. In some occasions, you will find Opossums invading a home with the food source. Therefore, all you need to do is ensure that all the trashcans are in good condition and there is no unwanted food left easily available anywhere. By securing your garbage cans in your garage or putting them in an airtight container, you will be making it hard for them to get food. Keep your pet’s food either inside the house or in a locked pet house. Moreover, do not leave vegetables or fallen fruits on the ground because they will attract opossums. Opossums only leave your home alone if you give them a good reason – no source of food at all. There are certain parts of the house that Opossums target in order to get clear access to your home. A home without a proper fence structure is more susceptible to opossums. Vitally, ensure that your yard, garden or the entire home has a good fence structure around it that gives opossums a hard time to get past. Some of the reliable fencing structures that you may want to go with when putting up a fence are wire mesh fence or picket fence. Bury the fence at least a foot underground and ensure that it extends a few feet above the ground to prevent the opossums from burrowing under the fence or jumping over it to access your home. Repellents come in handy when you want to keep pests away from your home. Notwithstanding, opossums prove a hard nut to crack when you use certain repellents in your home. For instance, predator scents as well as aversion odours will not make much of a difference when you want to get Opossum removal. One sure way of eliminating these pests from your home is by setting up a motion-activated sprinkler system especially in areas where they like to go such as gardens and yards. When they go to these places and meet the motion-activated sprinkler system, it will spray and scare them away. With this system in place, you are not likely to have them hovering around your home area in search of food or shelter. Conventionally, opossums will target your attic or garage for a habitat. They will find the place ideal to live in if it comes with warmth and no dampness. If you have an attic invaded and choose not for Opossum removal services, you will have a bad odour not from only the animal but also all the waste it produces. Ensure your roof has no open sections from poor workmanship to damages caused from storms. The same applies to the garage where roof and doors are secured from these pests. In general, opossums can make quite a terrible mess in your yard if you are not keen enough to secure your household waste. They will readily attack your garden of veggies and eat them all if they find no fence around it.